"Elizabeth is an amazing teacher who brings clarity of movement and a sense of fun to each session. The combination of Pilates and aerial arts is ideal for students who want to find stability in the core and shoulders, while minimizing the risk of injury. Her classes 'fly' by as her students discover their courage, creative expression and strength." "Elizabeth exemplifies all the necessary qualities of an aerial arts instructor : knowledge of safe technique and execution, safe and effective rigging and spotting, supportive critique, and lots of patience." "I had a terrific time in Elizabeth's class...she is truly a moving sculpture of grace and strength. Very inspiring." 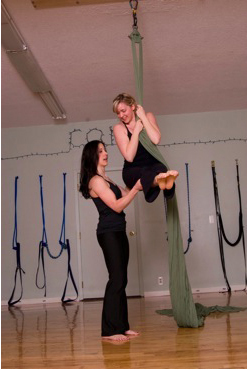 "I worked with Elizabeth when I was just starting out in the aerial world, and it was a great experience. By the end of one session, I was much stronger and more flexible, and I could already do some cool moves. Our class had folks with a range of ages and abilities, but she adapted things and provided assistance to make it both fun and challenging for each person. She also kept it safe - it is easy to get confused when you are upside down hanging by a little piece of cloth, but Elizabeth never let any of us fall or get hopelessly entangled." "Elizabeth is a wonderful instructor. She is always sweet and supportive, and the circus arts have been a fantastic, fun and creative way to work out my whole body." I wanted to send you a quick note about Saturday's class...it was amazing! I felt intimidated before class (especially when I saw the equipment) and was pretty sure that I was going to have to do a lot of modified exercises. I tend to think that I have a very weak upper body and don't always give myself enough credit for what I can accomplish. On the contrary, this class made me feel strong, proud and inspired. From the moment we started class you made me feel at ease and confident. While I'm sure I didn't always look 'pretty,' I left feeling really great about what I had accomplished (and I've been telling everyone about it)! Thanks for creating such a cool class and for being such a strong and inspirational trainer! I appreciate you!" "Working with Elizabeth was a wonderful experience. She was phenomenal!" "Elizabeth is a beautiful and very professional performer. Her silk routine as the perfect fun, exciting, and beautiful entertainment for our fundraiser." "Elizabeth's performances are mesmerizing. With tremendous grace, strength and lyricism, she takes her audience into a narrative through movement. She is a must see!" 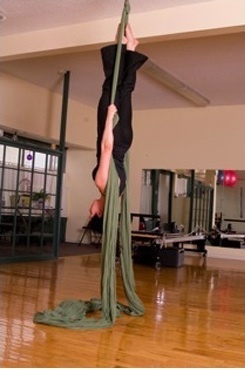 "Elizabeth is a true talent as an aerialist and as a dynamic performer. She not only possesses advanced skills as an aerialist, but also gives a riveting, creative performance on mulitple pieces of apparatus. When I saw her perform at the ARLP fundraiser I was blown away by her amazing performance."